A touching story for Passover, first published in 2015. Old columns never die…they just lie in the archives until the same debate rears its head again. In regards the funding of libraries (pronounced “libaries”) here is something I wrote in 2011. I think private funding is a great idea. I’m half-Norwegian, so I absolutely get that we Scando-types are not smiley. But this little girl needs to laugh more. Further, how did she get to Rome? Did she walk? And if you don’t know what a pill is, read my Wall Street Journal column here. It’s a quiet, rainy Good Friday. Currently contemplating whether I should go out and try to get some pictures of the procession. Wanted to comment a bit on Notre Dame and the fire. First, read this great piece by historian Tom Holland. Second, I’m a bit tired of hearing all of this silly sort of “instead of millionaires donating money to rebuild a church, shouldn’t these same millionaires be building houses for the poor” comment repeated over and over. Lovely ideal, but one needn’t have spent years studying economics to understand why this is not how things function. If it were that simple such decisions would be so much easier and clearer, and no one would be destitute. 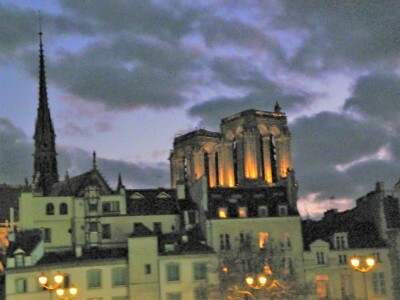 Third, here’s a bad photo I took of Notre Dame, four years ago. I have taken good photos of the cathedral, but I have a fondness for this picture above the others. Significant Other and I were in Paris and I convinced him to take a boat ride along the Seine. I had seen Audrey Hepburn and Cary Grant do the same in Charade and imagined us in elegant splendour, drinking champagne. Instead, ’twas a nightmare: crowded with loud, aggressive tourists; cold; rushed. I am a seasoned traveler, and should have known this was how it would be, but…I did get this photo and we had a great laugh about the whole experience. Paul Berman, one of the best essayists out there, writes about the great Alain Finkielkraut, anti-Semitism, France, the Gilets Jaunes and the latter’s recent attack on Finkielkraut. And much, much more. A long piece, but oh so worth your time. Hard to believe there can any uplift in the tragic mosque murders of Christchurch, but this article comes close. Do yourselves a favour and read more of his poems. Fantastic piece by Niall Ferguson in the Sunday Times, ostensibly about Roger Scruton and his having been let go from his position with the British government, but about more than that. I’m posting the whole thing because it is behind a subscription wall, dagnabit! Seventy years ago this month Nato was established to protect western Europe and the freedoms of its inhabitants from the threat of Soviet communism. It has become clear to me that we now need a similar organisation to protect western intellectuals from a growing threat to academic freedom. The North Atlantic Treaty, signed by 12 governments in Washington on April 4, 1949, was a treaty of mutual defence “to safeguard the freedom, common heritage and civilisation of their peoples, founded on the principles of democracy, individual liberty and the rule of law”. Article 5 of the treaty states that “an armed attack against one or more of [the signatories] . . . shall be considered an attack against them all”. It would be an oversimplification to say that this alone deterred the Soviet Union from attempting to extend its power any further west than the River Elbe. Nevertheless, the commitment of successive American presidents to Nato, along with the presence of US troops and missiles in western Europe, may be said to have worked. During the Cold War, Moscow sought to expand its influence in Latin America, the Middle East, east Asia and Africa. It left western Europe alone. In those days a small but courageous group of western academics did what they could to expose the wickedness of communism and to support political and religious dissidents in the Soviet sphere of influence. A member of that group was Roger Scruton. During the 1980s he travelled to communist-controlled Czechoslovakia to assist an underground education network run by the Czech dissident Julius Tomin. In 1985, during a trip to Brno, Scruton was arrested and expelled. A philosopher of international renown, a prolific author, a composer and a polymath, Scruton has one of the most powerful minds I have encountered. But he is one of those rare thinkers who seek to change the world as well as to understand and explain it. There was a time when those qualities were venerated. In 1998 he was awarded the Czech Republic’s Medal of Merit by its then president Vaclav Havel, himself a former dissident. A knighthood came in 2016. And last year he was appointed chairman of the government’s commission on buildings. Almost immediately after that, however, the attacks from the left began. The campaign against him culminated last week in the publication of a cynical hit-piece in the New Statesman, which misrepresented his views on a number of issues — the influence of George Soros, China’s policies of social control and the origins of the term “Islamophobia” — in order to portray him as a racist. The government took the bait. James Brokenshire, the secretary of state for housing, immediately sacked him. A spokeswoman for the prime minister described his comments as “deeply offensive and completely unacceptable”. A month rarely passes without some such tale of a conservative academic being “taken down”. In March it was the turn of the Canadian psychologist Jordan Peterson, who was informed by Cambridge that the visiting fellowship he had been offered by the faculty of divinity was being cancelled. The reason? At a book signing he had been photographed standing next to a man with a T-shirt bearing the (obviously facetious) slogan “I’m a proud Islamophobe”. Before that it was the US political scientist Samuel Abrams, who now faces a “tenure review” at Sarah Lawrence College in New York. His thoughtcrime? An article pointing out that academic administrators are even more left-leaning than professors. January’s cause célèbre was that of Peter Boghossian, a philosopher at Portland State University, who is being investigated by his own institution. Why? Because he was one of the perpetrators of the brilliant “grievance studies” hoax, which exposed the ease with which supposedly scholarly journals could be duped into publishing bogus articles. Then there’s Roland Fryer, the Harvard economist who has been suspended for more than a year because of highly questionable allegations of sexual harassment. I have a hunch those allegations might never have been made if Fryer, an African-American, had not published a paper concluding that the police did not, after all, use lethal violence more readily against black suspects than white. And let’s not forget Professors Nigel Biggar and Bruce Gilley, both denounced last year for daring to point out that not every aspect of the history of the British Empire was a crime against humanity. I could go on, but you get the picture. In every case the pattern is the same. An academic deemed to be conservative gets “called out” by a leftist group or rag. The Twitter mob piles in. Mindless mainstream media outlets amplify the story. The relevant authorities capitulate. The most striking common feature is the near-complete isolation of the target. Did Abrams’s colleagues step up to defend his (and their own) academic freedom? On the contrary: 40 of his fellow professors endorsed the student leftists’ demand that his tenure be reviewed. Did Fryer’s fellow Harvard economists question the way their only black colleague was being treated? Not one has publicly defended him. My message to all professional thinkers — academics, public intellectuals, writers of any stripe — is this: we either hang together or we hang separately. Even being an avowed progressive won’t help you if you fail just one wokeness test, as Bret Weinstein did when he objected to the idea of a “day of absence” for all white students and faculty at Evergreen State College in Washington state. A direct descendant of the illiberal, egalitarian ideology that once suppressed free speech in eastern Europe is now shutting down debate in the West. For those, like Scruton, who once helped Czech dissidents to get degrees in theology from Cambridge, the irony is bitter indeed. The lesson of the Cold War is clear. From now on an attack on one of us must be considered an attack on all of us. I therefore invite all who believe in the fundamental human freedoms to sign a new Non-conformist Academic Treaty. The present danger to free thought and speech is not Red Army tanks pouring through the Fulda Gap in Germany; it is the red army of mediocrities waging war on dissent within academia and the media. It is time to confront these people with the one thing that will deter them, as it once deterred the Soviets: massive retaliation. Divided we shall fall. But united we can ensure that the reputation destroyed last week was not Sir Roger Scruton’s but the New Statesman’s. So glad this creep has finally been arrested. Hope he spends a long time in prison. He is not a hero of free speech (nor is Snowden or Manning); he is nothing more than an anti-Western, anti-Semitic friend to tyrants, a narcissist, a liar and a self-aggrandizer. And don’t even get me started on how he treated his cat (though I would dearly love to know for sure that poor kitty is ok). This article sums it up perfectly. My dad used to sing this to us when we were little, and later to my nieces and nephews. He did it with similar verve and drama. So great!